Our business is changing. And it will keep changing as we grow and develop to meet our customer needs. This requires constant flexibility and an ability to respond to challenges – to see them as an opportunity for improvement. 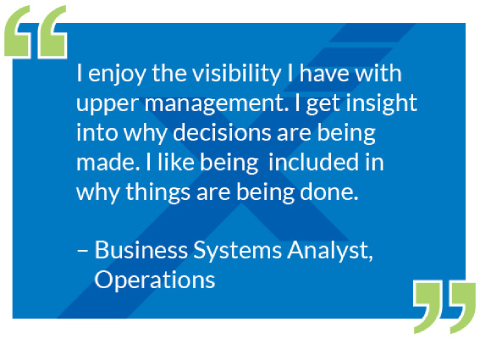 ​That attitude is why we are the industry leader in managed services. We’re still growing and so there are fantastic opportunities for careers that offer challenge, empowerment and the chance to develop your future, at your pace. On-the-spot awards – peer recognition gift cards, "employee of the quarter" luncheons in our L.A. headquarter for employees around the country, weekly shout-outs in the CEO’s weekly newsletter. We’re the nation’s premier Managed Services Provider, delivering unified communications, managed IT and network connectivity to 55,000 customer locations across the country. Our managed services reduce complexity and maximize profitability so organizations can focus on what they do best. Our Headquarters are in Los Angeles, and we operate more than 50 regional offices, including Las Vegas, Orange County, Sacramento, Houston, San Francisco, St. Louis, Waltham, Chicago and Denver. Copyright © 2019 TPx Communications All rights reserved.